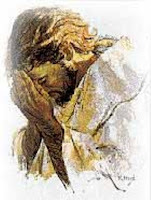 Jesus said " I have glorified you Father,now glorify Me..."
Jesus uttered this when he is troubled,that is when he is emotionally weak(anxious,worried,fearful,etc.) He needs the encouragement of the Father,a tap on shoulder,a hug and a kiss from his Father to encourage him and reassure him and make him or make his soul peaceful. "Glorify me ( glorify "god" as jesus glorify first "god") and I (god) will glorify you"